When the little one was 4 months old, we travelled to see his grandparents for the whole month. We decided to start with sleep training there. 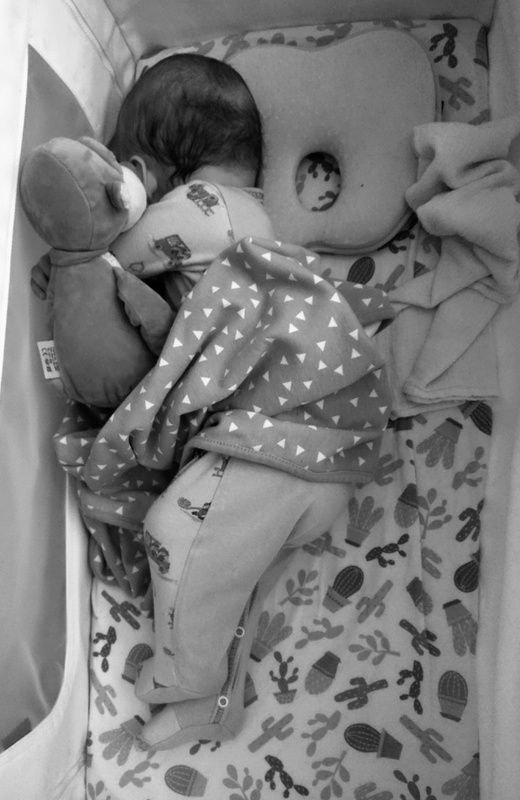 I wanted to improved so much Canito´s night sleep and applied evening routine to help him to learn how to fall asleep by himself, with no rocking as we did usually did it to put him to sleep. Then it happened, he woke up after hour or a bit more and we needed to do it again or nurse him. No long continuous sleeping. I was desperate. Not because of me, I was just thinking about the little one and how can we help him?! So I have applied our evening routine 🙂 It actually starts with his last day nap and then, around 6 pm we are starting. We have bath time! For all of us – fun and relaxing time. Canito is enjoying it a lot and the most, bathing time with daddy. Afterwards, his “dinner” and then to bed. And how did we start? I put him to bed and sit next to his crib until he fell asleep by himself. It took him almost 2 hours the first night!! Of course, he did not stay calm the complete two hours, but no crazy crying or complaining. When he started to cry a bit, I gave him toy, talked to him, cuddled him… everything what made him calm, which worked almost immediately. And then… after 1 hour and 45 minutes, he fell asleep, hugging his changuito (monkey) and woke up after midnight, hungry. Amazing. So I fed him and put him to bed and he fell asleep in few minutes. I could not believe what was happening 🙂 And I was so happy and proud of my little one. I calmly fell asleep again and woke up around 5 am. Not a big deal. I am so happy, he is having good night sleep. I did continue like that 3 nights and the interval of falling asleep got shorter and shorter. Second night it was around 45 minutes and third night already 30 minutes. Following 3 nights, I sit in the middle of the room, so he could still saw me and not be afraid that he is alone. And no crying at all, just playing with his monkey and his blanket. After those 6 nights, I put chair close to the door and still being with him in the room until he fell asleep and the time got shorter and shorter and routine smoother… And how does it look now? I just put him to bed, tell him “good night”, kiss him and smile to him and leave him in him bed. He is asleep in few minutes 🙂 I am so proud of our little monkey. He still wakes up after midnight being hungry and our day still starts at 5 am. Hopefully, everything goes well in coming days and coming months. Now we try the day naps, however it does not go that smooth 😦 Any tips to share? How does it go with your little one?